Don Lope is aptly named as while ‘Garrido’ can mean ‘handsome and elegant,’ it also carries a suggestion of ‘garras’ meaning ‘claws’. Living with Don Lope are two women: his maid, Saturna, and a twenty-one-year-old girl named Tristana. The inhabitants of the neighbourhood enjoy speculating on the nature of Tristana’s relationship with Don Lope. Various theories are bandied about ranging from daughter to niece to wife. But in reality the young girl is Don Lope’s ward. As the orphaned daughter of a close friend of her Don Lope’s, Tristana is entirely dependent on her guardian’s generosity, a status which this serial seducer has exploited. Within two months of Tristana’s arrival, Don Lope has added her to his very long list of conquests; she is, in effect, his plaything. At first Tristana accepts this way of life almost without question, failing to appreciate the reality of her situation. She is young, pretty and innocent. But as her twenty-second birthday approaches, Tristana begins to experience an awakening, a longing for independence and a sense of freedom. As a result, there are signs that Tristana is starting to find life as Don Lope’s mistress more than a little distasteful. An ambitious and intelligent young woman, she dreams of learning a skill or profession, of living life as a painter, a writer or a teacher. Meanwhile, Don Lope is beginning to feel the effects of his advancing age. Sensing Tristana’s growing appetite to spread her wings, he begins to tighten the net around his young captive fearing she may deceive him or flee the nest forever. One day while out walking, Tristana meets and falls for Horacio, an attractive young artist and kindred spirit. The two young lovebirds continue to meet on a daily basis, a romance nurtured through afternoon strolls and, in time, secret trysts in the painter’s studio. Horacio, too, has experienced a difficult childhood. Orphaned at a young age and poorly treated by his tyrannical grandfather, he has found an outlet for his creativity through art. Horacio encourages Tristana’s eagerness to learn and the two feed off one another in a sense of mutual fascination and desire. Their love affair is teasing and playful. With her spirit fully awakened, and scarred by Don Lope’s predatory behaviour, Tristana longs for the day when she can make her own way in life. Despite her love for Horacio, she is keen to reach a state of ‘honourable freedom,’ unwilling to accept dependency upon any man however much she idolises him. And what of her home situation? Although she does not love her guardian, Tristana still feels tied to Don Lope in some way; she experiences a strange mix of emotions towards him. There are times when Tristana loathes Don Lope for taking away her virginity, but she also feels something bordering on affection as a daughter would for her father. In reality, Don Lope’s character is far from black and white; he is a curious blend of altruistic qualities and terrible failings. He seems to have two opposing consciences: one very pure and honourable in certain respects, the other rather reprehensible. In effect, he chooses which to apply depending on the situation putting them ‘on and off like shirts’. Don Lope soon guesses that Tristana has a suitor. The evidence of love is there; he can see it on her face and hear it in her voice. That’s about as much as I’m going to say about the plot of this wonderful novel, but there are a number of moves and counterplays to come which keep the reader guessing. Tristana is a joy to read, a subtle story of love, power, liberty, and creativity. As you may have gathered from my opening quote, Don Lope is a cunning strategist and not to be underestimated. At times, he behaves like a jealous lover, at others a watchful father or doting grandfather. He is a tricky character to pin down as we see various different facets of his personality. Tristana, too, is a complex individual, and her wishes change as the story moves forward. Even Don Lope’s maid, Saturna, is painted in a vivid and lively manner. She is Tristana’s confidante, and the conversations between the two women are one of the book’s many pleasures. The writing is sublime too: Galdós’ prose is elegant and sprightly; Margaret Jull Costa’s translation reads very smoothly. This is my second contribution to Richard and Stu’s Spanish Lit Month, and I must thank Guy and Scott for recommending Tristana, which I suspect will make my end-of-year highlights. You can read their excellent reviews by clicking on the links. Tristana (tr. by Margaret Jull Costa) is published by NYRB Classics. Source: personal copy. Book 2/20, #TBR20 round 2. 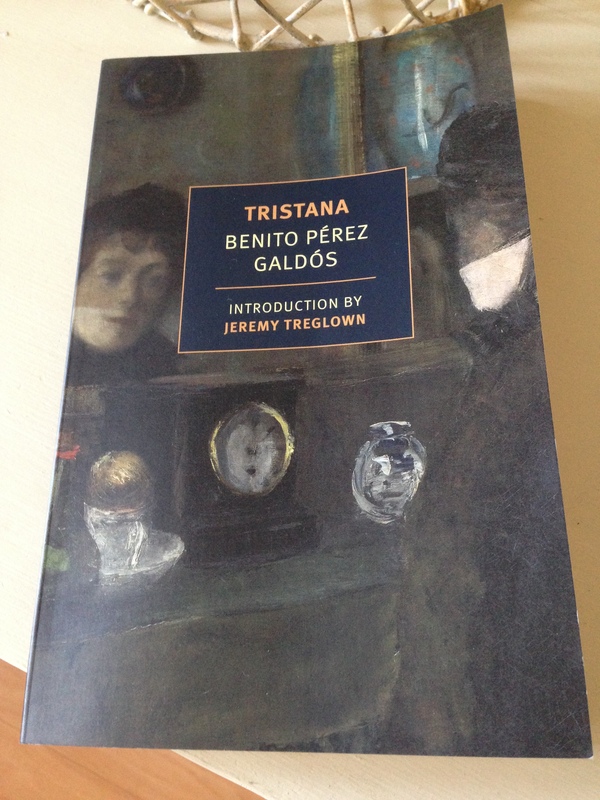 This entry was posted in Pérez Galdós Benito and tagged #SpanishLitMonth, #TBR20, #TranslationThurs, Benito Pérez Galdós, Fiction, Literature in Translation, Margaret Jull Costa, NYRB Classics, Spain on July 20, 2015 by JacquiWine.